He takes my finger and places it on a wet, tender-firm lump all the way in the back of his mouth. Immediately, I am transported back to memories of teething babies. Those little swellings would form, followed soon after by sharp, ridgy dots of white, visible on smooth pink gums. Aaron and I would run our fingers over the ridges, fascinated by the tiny tooth emerging. “It’s a tooth!” I told Jack excitedly. I did not expect him to burst into tears. He shakes his head slowly, sniffling, his face wet with tears, nose running. “Your other grown-up teeth are coming! All of your baby teeth are going to get loose and fall out and your grown-up teeth will come in! The bump on your gums means that this will probably happen really soon! You get to put the teeth under your pillow!” I struggle to keep my upbeat tone though I am distracted by how bizarre my “reassurance” sounds. Jacks eyes grow wide. His face is pale.”Will it hurt?” he asks. My voice takes on this high-pitched, falsely chipper tone. I sound insane to myself. Jack starts shaking and crying so violently that he can hardly breathe. the slight taste of blood in your mouth. My shoulders tense as my mind fills suddenly with images of the tooth dreams that have plagued me for years. 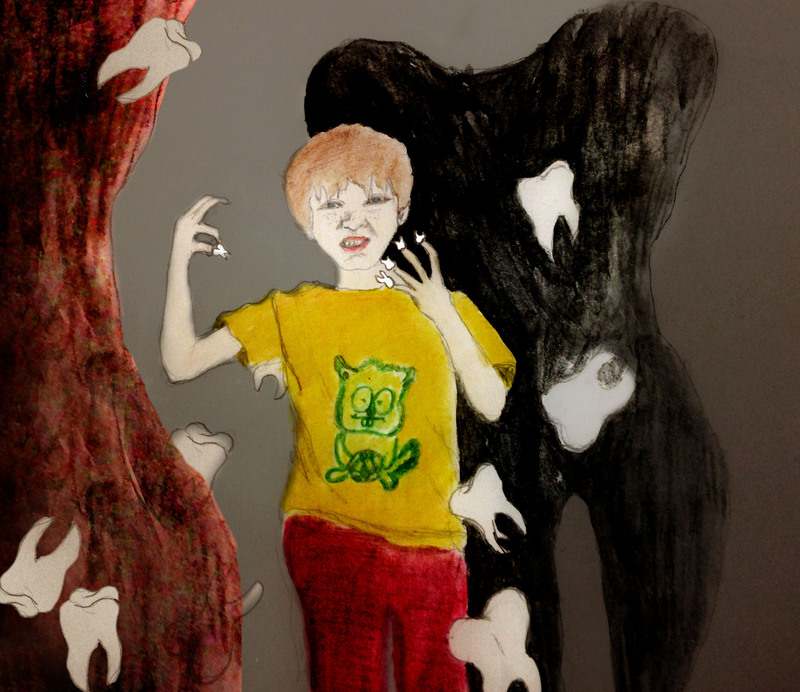 A quick google search reveals that dreams of teeth are common and completely unoriginal anxiety dreams. Common they may be, but mine are painfully vivid and leave me wide awake, filled panic and horror and deep shame. What I always think of as my first tooth dream,though technically more of a “gum dream”, is seared permanently on my mind. I remember sitting up breathlessly in our house on Van Vorst St, in the room I shared with my sister. I frantically examined every corner of my mouth with my tongue to reassure myself that the dream was not real. I remember focussing my eyes on the familiar sight of Molly asleep in her bed surrounded by stuffed animals, to calm myself. But most of all, I remember the details of the dream. I can see it still. It is a sunny, summer day. I am walking slowly down the path in front of our house when all of a sudden my mouth feels full. there is this terrifying pulpy presence in my mouth. this odd sense of emerging bulk. I push the damp mass from my mouth with my tongue and I watch it fall heavily to the sidewalk. Lying there is a large, pink chunk of my gums, mesmerizingly moist and spongy. It glistens in the sun, like a dropped chunk of watermelon. I take another step and again my mouth is full. Again I spit out a wet hunk of flesh. It happens with each step and I remember reaching the end of the pathway, where our front walk met up with the sidewalk, and looking back at the ghastly wet trail leading up to the front porch and feeling overtaken by terror. but a hard wet presence in my mouth. There is always an awkwardness in the dream as I try to figure out what to do with the tooth and how to hide the mortifying gap in my mouth. to protect it’s sensitive newness. What if these dreams, so common in our culture, are really a memory of trauma? A memory of the anxiety that Jack is experiencing right now. Right now, as he attempts to wrap his mind around the idea that parts of his body can just fall off or that new parts can force their way in. Somehow we push it down. We tell ourselves that a fairy and a shiny new quarter will make it all okay. While the boys were on an extended visit with my parents in Upstate New York, it became their custom to listen to the soundtrack to Les Miserables in the car. For some reason, it has struck a deep chord in Jack. He has never seen the musical. He has never seen the film. 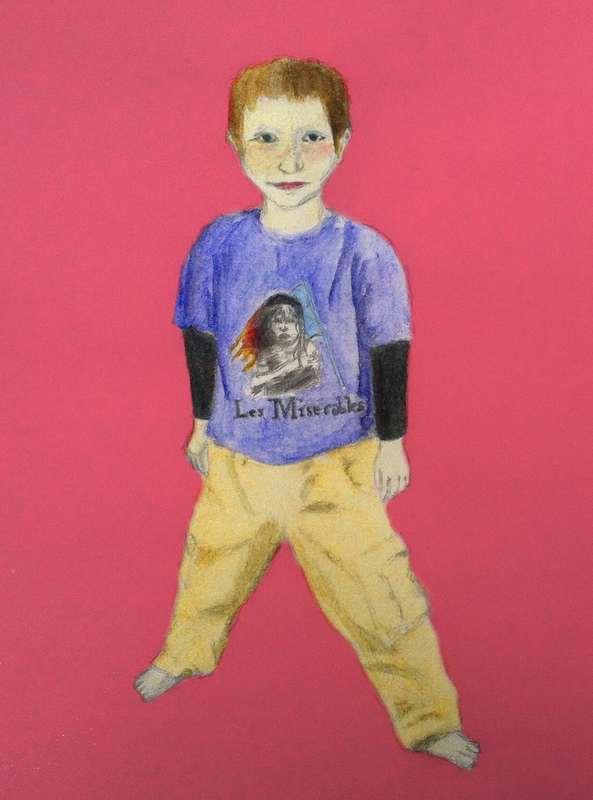 The story exists to him in the form of the music and whatever my parents have told him about the plot. And for a few weeks after his visit it was Jean Valjean this and “Master of the House” that. Knowing even less than my children about Les Miserable, I was at a complete loss to understand this new obsession. When the craptastic live version of The Sound of Music aired on NBC not that long ago, Jack cannily deduced that my inability to resist watching meant that if he sat with me, I would be absolutely incapable of leaving my spot on the couch and that he’d be allowed to stay up really late. At first he seemed to be trying to disappear into the couch so that I would forget he was there. But at some point, around the time of Liesel’s “Sixteen Going on Seventeen”, I noticed that he was leaning his entire body toward the television. The glow of the TV screen bathed Jack’s freckled nose in a transcendent light. His blue eyes were wide with wonder. I couldn’t even hate-watch Vampire Bill and that blonde in a satisfying way because Jack kept defending what he was seeing, and was so wrapped up in the music. The next morning I woke him up early and we watched the Julie Andrews movie huddled on the couch together before Zeke and Aaron even got up. Jack and I sang along with the children as they frolicked through the streets in their curtain outfits and cheered when it was revealed that the nuns tampered with the Nazi’s car! It was a wonderful mother-son morning. Though I didn’t think much about it afterwards. On Sundays the boys take a class at the Society for Ethical Culture. There they spent some time discussing Martin Luther King Jr. and the Civil Rights Movement. Their teacher explained to them that when King was alive, the laws in our country allowed people to be treated differently based on the color of their skin. She told them that Martin Luther King Jr. wanted all people to be treated equally, judged by the content of their character. The teacher told me that when she explained this to the class and read them a story about him, she saw Jack thinking very hard. She could tell that he was processing all that he was being told and considering it in a serious way. After the story Jack raised his hand and said that he thought that the way black people were treated in America sounded a lot like the way the Jews were treated in The Sound of Music and the poor were treated in Les Miserables. People hated them because of their religion or because they didn’t have enough money to take care of themselves, and did not pay attention to the contents of their characters. The next week, as they continued discussions of King, the children were asked to share dreams that they had for the world. A 4th-grader in the class said that he dreamed that children would be treated as more than just numbers. He said that he felt that the standardized tests in his school reduced the students to their score and took away their individuality. Jack was quick to raise his hand and say that this was a lot like Jean Valjean in Les Miserable, who was referred to by a number when he was in prison, when he wanted to be referred to as a person, as a man with a name. I have never seen Les Miserables in any form and I have to admit that the music does not really move me. I like the goofy cheeriness of The Sound of Music but I certainly haven’t spent time listening to it since I was barely older than Jack. I generally feel that musicals are pleasant but simplistic– like slogan t-shirts or bumper stickers. Sure, I can enjoy them, they’re just not that substantial. But when I see the way these two examples of an art form I have dismissed as melodramatic and corny, have been able to engender deep thoughts in my son about injustice and inequality, I have to re-evaluate the Musical and it’s unique capacity for using a rousing melody to present us with simple human truths. So simple, a 5-year old can grasp and internalize them. Love was all of the feelings in one. And when I think of Jack and his possession by the ideas in these musicals, I want to laugh and I want to cry. I have this amazing sense of dramatic movement which comes from watching this small person make sense of the world with such a keenly honed instinct. I marvel at the way that my son can find such deep awareness and meaningful connections in something so simple, that to me is merely vaguely pleasant. I am profoundly moved by his compassion and terrified for him to get the more complicated view of the tragedy and evil rampant in humanity. I feel all of this at once. And I am sure that what I am feeling is Love. walk forward in a walking position…. “Walk forward in a walking position. crease of your opponent’s neck. The moment that my father said those words, I was instantly taken over by a wild feeling of giddy exhilaration. put your right hand next to your right cheek. He would stand on the floor and place me on the bed, standing in front of him, so that we faced one another, as equals. And then it would begin. Elated swinging arms and gentle jabbing of fists in the tickley belly parts. He would hold me steady with one hand on the small of my back and “jab” my tummy with the other hand until I was more giggling puddle than little girl. When I’d had enough, he would pull the stabilizing hand out and I would flop down and bounce on the bed, hysterically happy and ready for another round. My father boxed with the Grand Street Boys when he was a kid. This is not what it sounds like. He is basically the opposite of a tough guy. But, as a boy, he did take several years of boxing lessons at a community center on the Lower East Side. There is a video of him boxing another little boy on the Perry Como show when he was 11. He is all smiles and skinny arms swinging in wide circles. He is a scrawny little torso hovering over enormous shorts, emerging from which are spindly legs that never stop moving. The constant dancing back and forth clearly fills him with such joy and was probably a perfect outlet for some of that extra energy that kids constantly need to shake off. The gleaming grin never leaves his face, or the faces of anyone else in the clip. The boys are playing at fighting, just throwing themselves at one another for the love of movement and life. The whole thing is accompanied by bouncy strings and you can’t help but be happy when you are watching it. The joy my father felt in those moments was clearly something that he wanted to give to my brother, sister, and me when we were kids, and so our crazy boxing game was born. And I do something like this with my boys. We have wrestling matches on my bed where they leap on top of me and try to “pin me”, basically by laying down on top of me and hugging me tightly. I always win– I’ve got 90 pounds on them– and I snuggle-pin them with little effort. We are always overwhelmed with laughter and the warmth of the moment fills the room, making me long for their childhood to last forever, making me squeeze them just a little longer, just a little tighter. About two years ago, Aaron and I were looking for something new and different to sign Zeke up for and heard some good things about a karate place nearby. It seemed like a fun way to burn off some energy and we hoped it would encourage confidence and focus. Zeke was beyond adorable in that floppy white uniform and I love watching him punch and knee-kick the air, run around, and shout out the count in Japanese. And when they spar, they are like puppies tumbling around the mat. 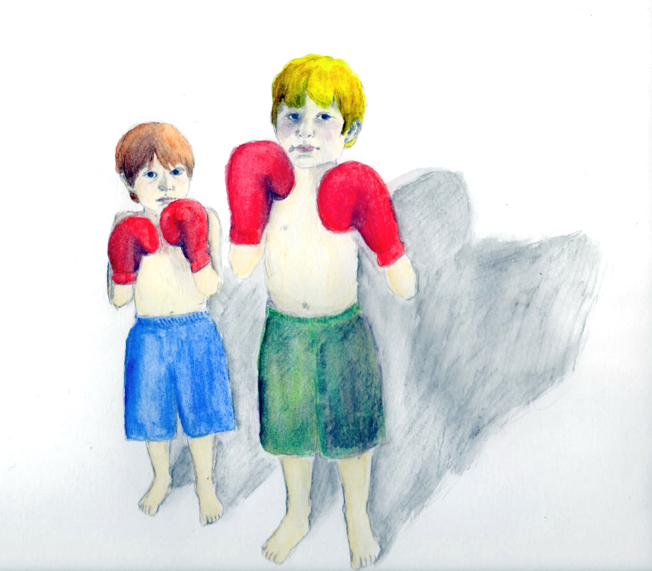 Bodies loose-limbed, all shining eyes and playful punches. When Zeke fights his teachers or a senior student, his cheeks go pink and the absolutely extreme width of his smile makes his whole head resemble an apple split in half. It is a joy to watch them dance around one another, miming a kick with a tap of the tip of the toe, or just brushing their knuckles across their opponent’s chest. So when Aaron started taking class there too, I had warm feelings about the place and I was eager to support his cheery new hobby. That is, until I attended his first belt test. The first half of the belt test, where the children’s skills were tested, filled me with the same pleasure that it always had, and I was not prepared for the dramatic shift in mood as the adult students took their places on the mat. All of a sudden the glowing room of parents, cellphones raised, cooing encouragement, transformed into a room where fists are pumped and grunts of excitement echo each time the sickening thud of a solidly landed punch reverberated through the dojo. Shouts of “Great Job Sweetie!” gave way to bloodthirsty bellows of “Now THAT’s what I’m talking about!” as two solid adults square off against one another. When Aaron’s turn came I felt sick to my stomach. Every time he or his opponent landed a punch or a kick people in the dojo would shout triumphantly. The salivating anticipation of the fighter’s pain among the spectators seemed to swell my chest making it hard to breathe. Then Aaron lost his balance when he kicked the other guy, and fell down hard on the mat. This man in black-rimmed glasses standing next to me, barked, “Yes!” in excitement. I felt ill. “That’s my husband!” I wanted to yell. And I was glad that the boys were playing with their friends in the back of the room and not paying attention. I felt like karate just wasn’t what I’d thought it was. There is nothing heart-warming about watching sweaty men try to make brutal contact with one another, even if they are doing it for fun. A few months later, determined to be supportive and not a lily-livered spoilsport, I took the boys to watch Aaron fight in a tournament in Newburgh. I truly wanted to stand there and cheer him on and for the boys to be proud of their dad. But when I saw the red-faced intensity of the people on the sidelines shouting at their family and friends to annihilate the person across from them I began to have real feelings of misgiving. When I looked around the school gym where the tournament was being held and saw lanky, acne-spattered teenage boys, barely able to stay on their feet, weaving, eyes unfocused from hitting their heads too hard, I began to feel that I was in the wrong place entirely. When Aaron’s match was finally called he was so excited, a boyish smile dominated his whole face and he couldn’t keep still. He kept running and jumping in place, bare feet in constant motion as they stuck out of his gleaming white gi. And then his opponent walked up and I felt my stomach hit the floor. I was overcome by the desperate need to stretch my smile out as wide as it will go so that no one, certainly not the boys, would be able to detect the horrid trepidation I felt about being stuck in this horrible place. The guy was young, probably 24, and when I looked at his arm, I saw a prominent USMC tattoo and immediately cast him as a recently discharged veteran from the Middle East who needs an outlet for all of the anger he built up while witnessing the horrors of war. The idea of having to keep my upbeat attitude so that the boys won’t start to feel upset is overwhelming and I was afraid that I was going to cry. It was then that I thought of this Shel Silverstein poem that I’d always loved. This is the game that I thought we were all playing. I thought we were rolling around and laughing and just wrapped up in the playful love of parents and children. I don’t want to know that I am training my sons for actual fighting in a world that is filled with actual violence. I just want to giggle and roll around on the rug. I have managed to block out most of Aaron’s fight in Newburgh. He didn’t win, but he wasn’t seriously injured either. And our children were not traumatized, but I’ve made only sporadic trips to the dojo since. Fighting seems fun now, but sprightly violins will eventually give way to intense, pounding percussion and I have never lost my taste for the gentle games of my childhood. Those words still make me smile. My husband and I got a rare break from the incessant demands of childcare the other night when my parents came and took my children to stay with them for an entire week. We celebrated our first night of freedom with a trip to the movies. It was hot out and we decided to go see The Heat. It was supposed to be funny and didn’t look particularly mentally taxing, which seemed to fit the bill for the evening. We chose a theater near Union Square to catch the movie and as we walked by we saw many people gathered there. They were in a pen created by metal barriers, reinforced by a battalion of police officers who stood, hands on hips, on the other side. We couldn’t cross the square without asking permission of an officer to go behind the barrier and then asking again to be released. The people who stood there held banners made from bedsheets and placards with slogans scrawled on pizza boxes. They were quiet mostly. There was a feeling of mourning, mostly. Our movie was starting soonish and we were both hungry, so, rather than cut across the square and be forced to deal with all of that, we went the long way around to find someplace where we could quickly grab a bite. After artfully stashing my chocolate covered pretzels, Diet Coke and yogurt in my bag, we went into the theater and found seats. My husband and I engaged in our usual negotiations about what row to sit in: he going right to row 2, me to row 15; both eventually ending up together, somewhere in the middle. As always, we silently conferred about the previews, shaking our heads disapprovingly at the stinkers, exchanging raised-eyebrow glances at those that looked promising.We munched our snacks, basked in the air-conditioning, and held each other’s hands.We were ready to be care-free and to laugh at a ridiculous profanity-laden film, that we could never take our children to see. And The Heat was funny! The whole audience was rollicking: laughing loudly at every crazy, inappropriate thing that wackily-vested, frizzy-haired Melissa McCarthy said; guffawing whenever characters onscreen rolled their eyes at uptight Sandra Bullock with her stupid, fussily bobby-pinned hair and her tailored lady suits. My husband was issuing these deep belly-laughs with a wet choking quality, and as I watched him wipe tears from his eyes and lean back in his seat so that he could relax more deeply into the laughter, I noticed that I was distracted, merely issuing a polite chuckle here and there. I really wanted to laugh but for some reason, like an annoying pebble in my shoe that I just couldn’t ignore, I found myself picturing the photos printed out on paper and glued to the back of pizza boxes, the slogans painted in neon colors and outlined with sharpie, and the people who I’d seen, somberly standing in an improvised cage surrounded by uniformed officers. I felt like a wet blanket. I was there to escape– to have fun. So when Melissa McCarthy ripped off Sandra Bullock’s uptight trousers and knelt staring at her fastidious beige Spanx, completely aghast at the rigid little woman before her and the depth of her control issues, I tried to get into it. It was really funny. Really. But then, there was this other scene– it’s a really funny scene–it’s in all the commercials, so you know it’s a highlight– where our girl-power buddy cops hang a perp by his ankles upside-down over a fire escape. And the perp is this young African-American man, who admittedly is a drug dealer who has information that our ladies need, but I found myself distracted again, unable to relax back into the film. 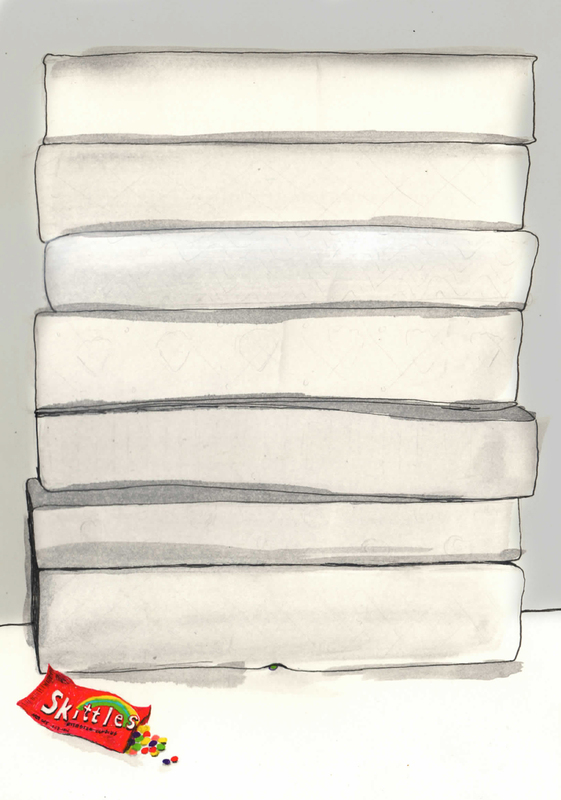 Oddly, I found myself reflecting on The Princess and the Pea. There’s this prince who is determined to marry only a “real” princess. He meets all sorts of beautiful girls but finds fault with all of them– they are not “genuine” enough for him for one reason or another. Then, in the middle of a violent storm, a bedraggled girl shows up at the palace doors, claiming to be a princess who needs shelter for the night. The Queen suspects this drowned rat must be lying, so she places a pea under twenty mattresses and twenty feather-beds and then sends the girl to bed. In the morning everyone is stunned when the girl emerges looking exhausted, and complaining of bruises on her body from some horrible lump in the luxurious bed.. She eventually admits that she was tossing and turning all night long, unable to escape the pain of whatever was under the mattress. She must be a real princess, everyone decides, for only a real princess could be sensitive enough to have detected that tiny pea. I never liked this story. It irritated me that the ideal princess was so delicate, so over-sensitive, that she couldn’t just roll over, away from the teeny pea lump, and get some rest. She seemed like a prima-donna, annoyingly over-sensitive, just indulging herself in pointless drama. But here I found myself, unable to just roll over and settle back into a trivial summer comedy, because I’m focused on the young man on-screen, whose humanity and civil rights are being completely disregarded (to great comic effect) by people who exploit their power and authority and take extreme measures to do what they, admittedly, passionately, feel is necessary in order to protect the community. Every time that the audience rolls their eyes at Bullock’s namby-pamby insistence on creating a dialogue with a suspect or following protocol, I find myself shifting uncomfortably in my seat. Every time McCarthy whips out her gun to get her way and says something crazy, I find myself unable to just enjoy the film and laugh with everyone else. And I’m annoyed with myself, because I don’t want to be that girl— the one who’s so sensitive that she can’t take a joke. But still, I find myself staring into the darkness, distracted completely by my circling thoughts, like annoying lumps in my mattress that I just can’t avoid. I have two sons. They are 4 and 6. Just little guys. And through being their mom, I find myself deeply enmeshed in the world of little boys and all of their exuberant “boyness”. I’ve loved watching these boys at play, watching them grow up. I love them: the way their sturdy little legs all-of-a-sudden break into a full-on run, those soft-rounded boy bellies that mark them as our babies even as they gruffly try to be cool, even the way you can make any one of them hysterical with the barest mention of poop. I’ve smiled at these boys on the playground, at their dimples and their scabby knees. I’ve watched them strut around the neighborhood wearing capes. I watch them, all of them, with their scratched plastic Spiderman figures, or race cars, or random robotninjaaliens, clutched tightly like totems as their arms swoop majestically through the air and they mutter to themselves, unself-consciously engrossed in a wild, heroic adventure. I’ve watched their eyes shine with admiration when they watch bigger boys, boys who have skateboards, and ear buds, and heavy backpacks loaded with stuff. And as much as they are the same, I can’t ignore this nagging, lumpy difference. A difference that I cannot get away from, though I don’t really feel comfortable talking about it. A difference so deeply ingrained in our culture, that it can be the unquestioned foundation for a joke. A difference which means that my sons will grow up with a sense of safety and security and a trust in authority that will not be afforded to some of their friends. In 8 or 10 years, some of these boys’ parents will be teaching them to walk slowly and to keep their hands out of their pockets, to speak softly and keep their eyes cast down, while my boys will still enjoy the luxurious freedom of running haphazardly down Flatbush Avenue. And though it doesn’t feel right to spend all night lying on that lump- feeling it press into me, bruising my flesh, leaving me exhausted and in pain- it is not right to just roll over and go to sleep either. I never wanted to be a princess and I find myself really unsure of what exactly to do now. And all over again I have angry knots in my stomach and I want to kick my obnoxious neighbor in the teeth for ruining what used to be one of the most lovely parts of my day and suffusing, what was a sweet, calm ritual of exploration and discovery, with anxiety, mistrust, and fear. This is for you Ridiculously Rude Resident of Rutland Road. My kids can’t get you and your aggressive incivility out of their heads. fear to stop and smell the roses. We live in a large apartment building right on the border of a land-marked Brooklyn neighborhood that is filled with gorgeous brownstones and free-standing houses. It is common for people in our neighborhood to have things that are uncommon elsewhere in New York City, like backyards, generous front stoops, and lovely front gardens. Every morning when Jack and I are walking Zeke to school we wander past all of these houses and blissfully examine the beautiful new things that are growing. The three of us celebrated the coming of spring by noticing the appearance of precious little purple crocuses in so many of our neighbors’ gardens. 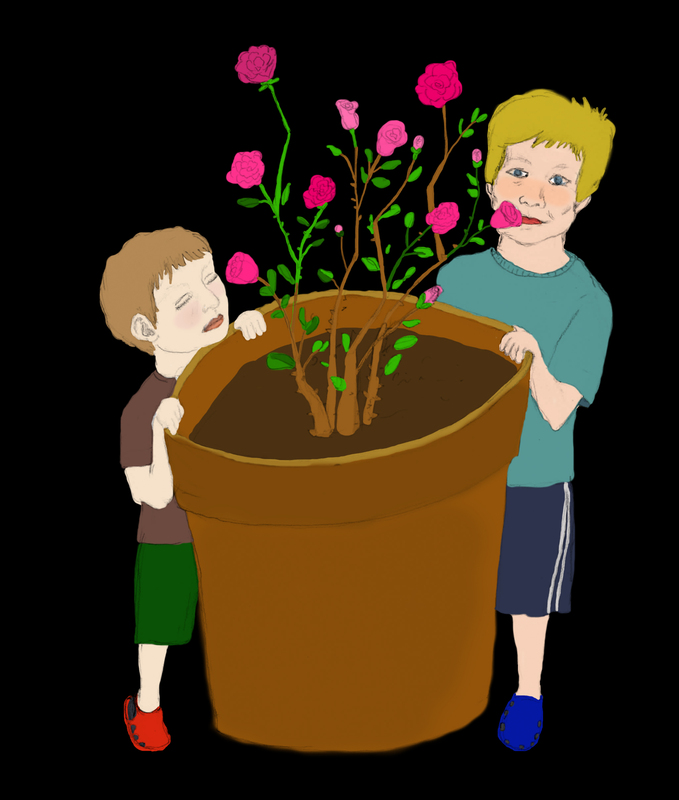 It delighted me when my boys would point out clusters of “Happy Daffodils” or point excitedly to a vibrant yellow-blossomed bush and shout, “Look Mom! It’s forsythia! Your favorite!” We were sometimes a little late for school because the three of us had lingered too long, noses clustered together around a planting of rich indigo hyacinth, deeply inhaling their fresh, heavenly scent. And when Jack would tell me that he wanted to turn on Rogers Avenue so that we could pass by the house with the “bunches of Bleeding Hearts“, I would have to summon everything that I had inside of me not to grab his little face and smother him with kisses. I love our morning walks, softly lit, before the sun is strong. I love this little opportunity to delight in gracefully growing things, right here, in the middle of Brooklyn, especially when we live in a big brick building that smells more of piss and weed than it does of Lilies of the Valley. One morning, in early June, we were taking our walk as usual. It had rained overnight and all of the plants were still moist from the light summer drizzle. The air was cool and soft. Zeke, Jack and I were admiring the way that the damp grey of the morning made the colors of the plants vivid and the way that the flowers almost sparkled when light would bounce off of a raindrop on a petal. We turned onto Rutland Road and all three of our pairs of eyes seemed to settle on the planter at once. It was a barrel planter on the sidewalk with a small, rather spindly, rosebush inside of it, but the few roses on the bush were immaculate. The blossoms were wide and fully blooming, a striking vibrant coral. “Those are beautiful Mom! What are they called?” Zeke asked. She continued to glare at us with profound hostility. I started to get really angry but I saw my children’s eyes growing wide with concern and I wanted to defuse the situation, but also to reassure them that we hadn’t done anything wrong. I knew that this was ridiculous. We were standing on the sidewalk. We hadn’t even touched her property, let alone damaged it in any way. But I could see how scared my kids, who are not used to harsh language from adults, were getting and I definitely didn’t want them to see me get into a pointless argument with some obnoxious stranger. So I ushered them along, and struggled to push down the knots of seething fury I felt stirring in my gut. I wanted to focus on seeming unfazed by the situation so that Jack and Zeke could just forget about it, but moments after we walked away, the questions started. Zeke gestured toward flowers planted in front of another house. “Is it okay to smell those? I realized that I needed to say something, to put some sort of label on what had happened so that it could make sense to my little guys and so that they would have an idea of how to feel about the situation. “Were you afraid?” Jack asked sweetly. “No?” he said, without much confidence. We walked on in silence. Inwardly I was cursing that woman for making it impossible to unselfconsciously enjoy our morning routine. Jack looked thoughtful as he walked. “I would say,” he told me. When Jack was about 6 months old and Zeke was 2 1/2, we spent a week at a family friend’s house in upstate New York, in the small town of Jeffersonville. We spent our days doing things that, to most, might have seemed pretty routine, but to boys used to city life, our vacation was exotic and exciting. When we drove along the long winding roads, we saw cows and horses, and tractors parked on people’s lawns, wonders that caused Zeke to point out of the window and exclaim with excitement. We could grill our dinner in the backyard, and sit on the porch to eat it. There was an old barn across the road, and each evening from our spot on the porch we would marvel at the hulking turkey vultures that would lurk ominously in the open hayloft. When the sun set, we chased fireflies. One sunny afternoon we walked down the road to the town library, where Zeke confidently asked the children’s librarian for all of the books she had about tractors. On another we wandered over to the brightly painted ice cream stand where Zeke ecstatically covered his face in vanilla with rainbow sprinkles. Even the screen door was fascinating to Zeke. He would swing it open and walk out, wait for it to latch, and then push it open and walk in. He’d never seen anything like it. It allowed him the independence to walk in and out of the house without any assistance, something that he never gets to do in our double-locked Brooklyn apartment, with it’s locked front door, and it’s elevator buttons high above his head. And on one bright morning, I noticed something else that we don’t have much of in Brooklyn. 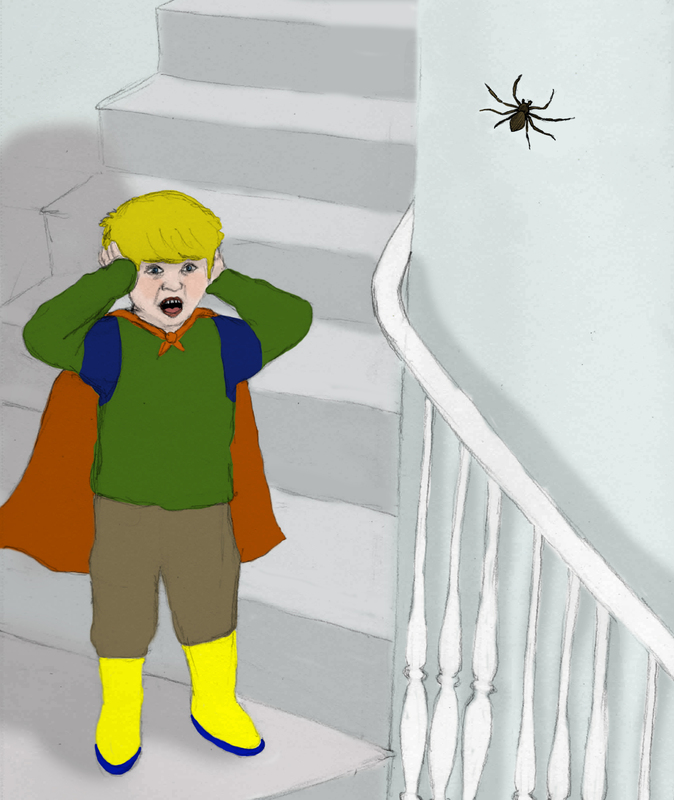 About halfway up the stairs, fuzzy and brown against the cream-colored wall, was a really large spider. Growing up in upstate New York, I remember running into spiders pretty frequently. Their webs would brush creepily against your face in the basement. One might skitter across the floor unexpectedly, causing my mother to shriek. I remember admiring their webs in the sun and in the fog and I also remember destroying them with sticks and gleefully watching when the poor arachnids came scurrying out to repair the damage. But in Brooklyn, I don’t see too many spiders. We have roaches galore. I’ve run across some funky centipede-y bugs, a surprising number of snails, and I’ve even had ants. But spiders, not so much. So when I saw the rather large specimen on the wall in Jeffersonville, I got excited and I really wanted to share it with my son. “Zeke! I want to show you something really cool!” I said. Zeke followed along gamely and sat with me on the steps. The spider sat motionless on the wall, the size of a half-dollar at least. Zeke looked at the wall blankly. “Where?” he asked, anticipation in his voice. “Right there.” I pointed at the wall. I was a little confused about what was confusing him, but ready to wow him with incredible Nature, I took a pencil out of my pocket and pointed right at the spider, causing it to run jerkily up the wall. As soon as the spider moved, Zeke’s eyes went huge and blank. He clamped his hands over his ears and he began to scream. gripped by blind terror, lost in a bloodcurdling primal scream. I was stunned and terrified by this reaction. I had never seen my child in a state of hysteria, and it had certainly never occurred to me that the spider I so eagerly pointed out would tap into some kind of instinctive gut terror. It took endless seconds for his eyes to refocus and for him to respond. I said nothing about the spider or the screaming and just asked him weakly if he wanted to go outside and play. About a week later, when we were safely back in Brooklyn, I tentatively asked him about the incident. He shook his head, a bemused look on his face, “That was crazy Mom.” he said. “You were kind of scared of it, huh?” I said casually, not wanting to reignite the fear, but also deeply curious about what had been going on in his mind. “That was so crazy,” he said shaking his head. I nodded in agreement and smiled, trying to project as forcefully as possible that it was no big deal. And here is where it became clear to me how skillfully the human mind can wall us off and protect us, how our memories can be re-formed to make them safer and to distance us from things that are too difficult for us to bear. I still don’t entirely understand his reaction, but I guess a part of me is really glad that he was able to transfer his fear and disconnect from that terrifying moment. Jack’s little body is heaving with sobs. He wails again and again, “How do I grow into a grown-up? How do I get bigger?” and he is breaking my heart. I am changing his diaper. Potty-training Jack has been a monumental challenge, and he is resistant to even the slightest suggestion that he start relieving himself in the potty. I am exhausted by the effort it takes to stick to my pro-potty talking points and disgusted by the foul mess that I must clean up day after day. In addition, I feel brutalized by Jack’s intense emotional response to the process. He wants the growing and maturing to be over, to just be “big” (and potty-trained), without having to experience the torment of growing. And that is when I pause, thinking all of a sudden of the oft-cited fact that children’s eyes reach their adult size from a very young age, some say as young as two, and that these “wide” eyes are what give children their irresistible look of innocence. But what does it mean that their adult eyes– shifting, watchful, careful not to betray intentions or vulnerability– are already there? 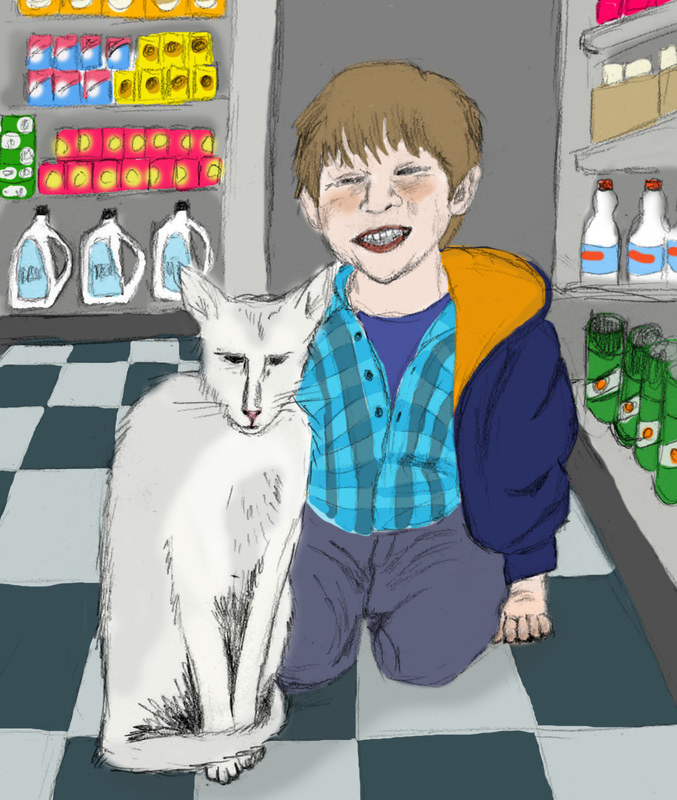 There’s a deli next to Zeke’s school– coffee, sandwiches, drinks– nothing to distinguish it from any other random bodega in our neighborhood, except possibly for one thing: this deli houses a scrawny gray and white cat. The cat skulks around, presumably to keep rodents from eating up the profits. And truthfully, even this doesn’t really differentiate it from other delis, except that for some reason, this scraggy, bony feline has completely captured Jack’s heart and imagination. And from that day forward, so it was. 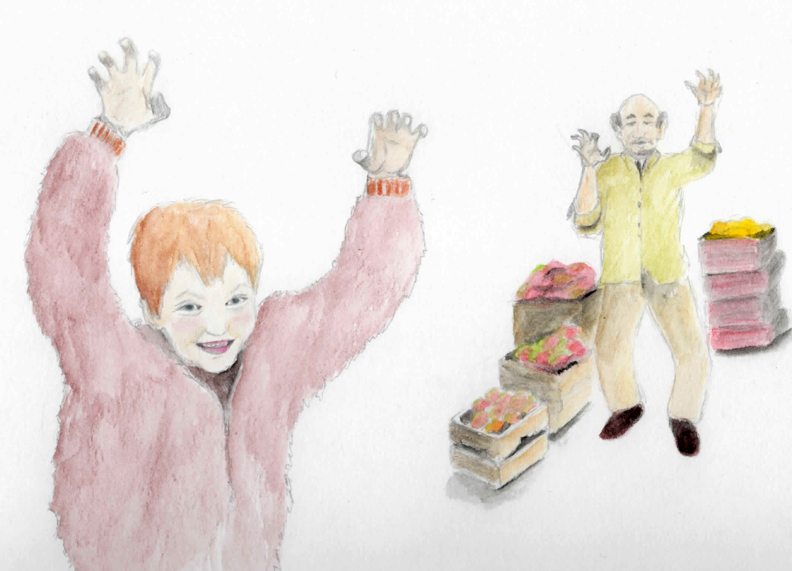 We went to visit Catty-Cat several mornings a week and as Jack happily wandered around among the racks of chips and peeked beneath the coffee machine, I felt creepily aware of the alert gaze of the deli’s proprietors, tracking our every move. In addition to the silent man behind the counter, there is a much chattier fellow, just a little taller than I am, the whites around his darting eyes huge and strangely bright. He dresses in an overly enthusiastic and dated “hip-hop” fashion, that calls to mind Ali-G. He would always greet Jack with a vehement friendliness, often grabbing Catty-Cat out of whatever corner she was hiding in and roughly presenting her to Jack. His tensed hand would be positioned in front of her paws as he spoke firmly in her ear , and loudly encouraged Jack to pet her. He always insisted that she was terrified of everyone but Jack, whom she loved (attempts to spring from his firm grasp and escape from Jack’s clumsy little hands, notwithstanding). Once he glanced pointedly at my wedding ring and asked me why I never came in with my husband, asked if he was “away in the army”. Another time he insisted on giving Jack a free snack from the shop, and as Jack happily selected a bag of “butter-flavored” popcorn, that I knew I would never actually allow him to eat, he told me about his two children, pounding forcefully on his chest as he insisted that his son was “his heart” and that he loved him much more than his daughter. He and his friend made me insanely nervous. I found myself trying to cross the street before we reached Catty-Cat’s deli. There was nothing I could put my finger on exactly that made me want to avoid it, but when we were there I always had a knot in the pit of my stomach, and I always kept a wary hand firmly on Jack’s shoulder as I hurried him through our visit and out to the safe anonymity of the street. But Jack took such pleasure in visiting Catty-Cat and it was hard to resist the joy shining from his child’s eyes, as he placed his hand on her protruding ribs and felt her vibrating purr. So from time to time, we did stop in, though I did my best to be brusque and never to meet anyone’s gaze. And as he ushered us toward the back room of the deli, I gripped Jack tightly and felt panic rising in me slightly. All of my adult instincts were telling me to be on alert, but a needling part of my mind told me that I might be being ridiculous, that this man had never been anything but friendly, and that there was no reason to deny a child an experience that made him so happy, or to make him feel nervous about people that had been kind to him and a cat that he had discovered and named. I wished that I could see it all with his innocent joy and wonder and turn off my full-grown anxiety. In the back room we saw Catty-Cat. She was grooming herself, perched on a dingy, once-white vinyl dining room chair. Jack’s eyes locked on her with delight and I found myself nervously glancing around the room. Next to the chair was a filthy over-flowing litter-box, and a giant hookah, as tall as Jack. The room was surprisingly empty for a store room. There were a few cases of A & W Cream soda, a variety of mops and buckets and a metal drain in the center of the concrete floor. My eyes kept being drawn to a strange lofted platform that dominated the room. There were 3 or 4 crudely built stairs that led up to it and a neon-printed shower curtain separating it from the rest of the space. Through a gap in the curtain I could see a large duffel bag and a precisely made pallet, where someone clearly slept. My heart and mind began to race as it dawned on me that SOMEONE LIVED BACK HERE– and I wasn’t sure if that was legitimately scary or not and I didn’t want the man to perceive that I was afraid and I didn’t want to frighten Jack, but I just wanted to get out of that room and back outside as fast as humanly possible. As I led Jack back to our apartment I was struck by how profoundly differently we experienced that morning in the deli. Jack chattered about Catty-Cat and was aware only of the magic of this living being, that ate and breathed, and felt things, and allowed him to interact with it. My mind was possessed by paranoia and the potential for danger. Whose mind did it make sense to dwell in? The world is certainly more lovely in Jack’s eyes. And it saddens me to imagine his child’s vision being clouded by fear and mistrust. My father studies Perception, and I remember him teaching me about the eye from a young age, quizzing me on of its various parts: the lens, the iris, the cornea, the rods and the cones. He excitedly explained that the brain fills in blanks so that we would perceive a clear and complete picture of what was before us. It seems to me that this is very similar to what my adult view of the world does to Catty-Cat’s deli. I don’t understand what is going on in there. There are huge and petrifying gaps in my knowledge about the deli’s staff and why someone might live in the backroom and why someone might tell a stranger that they don’t really love their daughter, and without the benefit of a complete picture, all of my mental alarms go off and fill in the fuzzy areas with a strident vigilance. Children are free to experience the unexplained, without that terror. We absorb all of the fear for them, tightly grip their little hands, and quietly scan the horizon for threats. In their yearning to grow up so quickly and to be independent, they have no idea that potty-training is merely the barest beginning of independence or of how incredibly sinister life for an adult can be. We teach them to use the toilet, and to tie their shoes, and to navigate the world on their own. And from us, they also learn to put their guard up. They have to. In order to survive, we all need to assess risks and think about the dangers that could be lurking in the places that we can’t see clearly. But, in the moment, in Catty-Cat’s deli, as I gaze at the contented glow on my young son’s face while he caresses that skittish bag-of-bones, I don’t mind that soon I will go home and change another dirty diaper. one hand on my son’s shoulder, one eye on the door. I don’t know where this new fear has come from. I can’t put my finger on exactly when it started, or what it is that sparked it. All I know is that now it has become routine to make a show of closing the door securely so that Jack feels secure enough to relax into sleep. I recalled The Big Ooh. I can still see Zeke laying in our bed, his little hands clutching the blanket tightly, where it was tucked beneath his chin, eyes wide and staring. We live in a building that is right off of Flatbush Avenue, a busy street in Brooklyn, where it is never truly dark or completely quiet. Aaron’s bicycle hangs on a hook near the ceiling and and as the cars rush endlessly by, headlights shine over handlebars and through the spokes of the wheel, creating patterns of light and shadow, which ebb and flow endlessly past. He was vague on the details of The Big Ooh. He seemed less frightened by her than intrigued. He told us that she had red eyes and that he only saw her at night because during the day she was busy “taking care of her children”. And, with a jolt, I remembered something else too. When I was a little girl, there were these “people” that lived under my bed. I wasn’t exactly afraid of them, but I was always very aware of their presence and that awareness made me a little uneasy. I’m not sure if I ever mentioned them to anyone, but I have very vivid memories of lying awake in bed thinking about them and being almost paralyzed by my profound awareness of their presence. 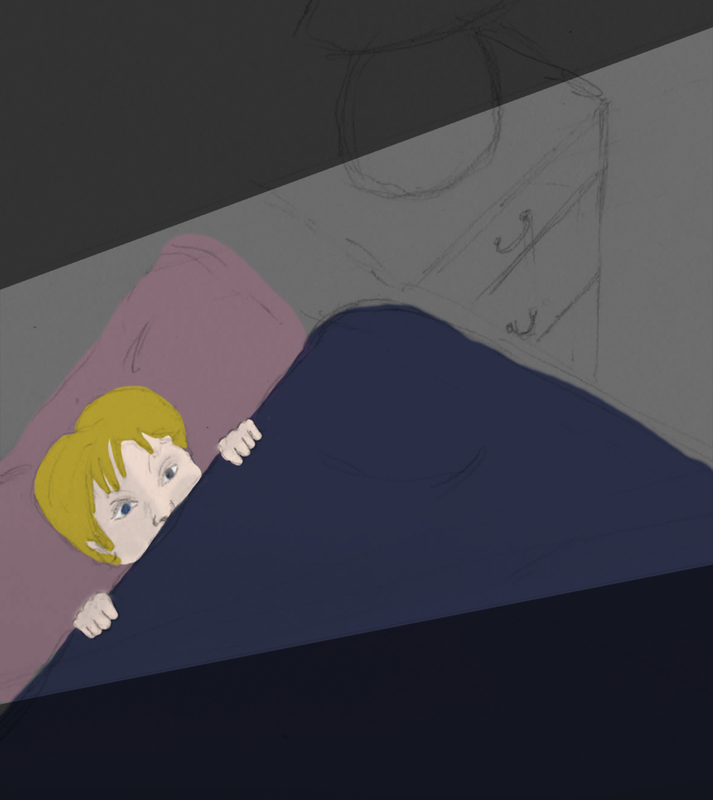 I remember taking deep breaths and resolving to be brave enough to hang my head over the side of my bed and peek down at them. It would take me a while to summon the courage, and my glances were always brief and breathless. They would lie with their backs to me, their stomachs on the floor, heads propped up on their elbows. They were fuzzy and gray; shadowy. They looked as if they were made of fog and hairballs and dust. And I knew they were under there, but I also knew that they would never come out. My memory of them is as vague as their lazy silhouettes were, but they remain one of the oddest and most exhilarating memories that I have, because my rational adult mind tells me that they couldn’t possibly have been under there. But I still remember them. And I never had an “Aha” moment where I realized that my overactive imagination was spinning dust bunnies or lost socks into mysterious lethargic beings. Their presence was never explained away, and I can still remember the way they looked, the way I saw them as a child. I have since asked Zeke about The Big Ooh and he has no memory of her at all. I suppose that whatever Jack imagines is lurking behind the door will fade away too. And as they grow and their childhood fears disappear, so too will the world where magic is possible. Danger will be all too unavoidably real and even a door that is firmly shut will not make them feel safe. As their mom, I desperately want to protect them from any and all danger, and to keep them safe within my tight and reassuring grasp. But there is a part of me that wants them to hold on to the indistinct creatures of the night, somewhere deep inside, even if they can’t really believe in them anymore. To remember that once, you believed. We spent some time in a small cottage in Vermont this summer. Our children shed their shirts and shoes moments after we arrived and it was a delight to watch my two Brooklyn-born boys dart about freely in all of that nature. They scampered happily through fields, amassed collections of sticks and pebbles, scaled boulders, and explored old barns. One evening Zeke discovered a copy of The Lorax by Dr. Suess on a shelf. It begins with a little boy exploring a barren wasteland and wondering how it came to be that way. 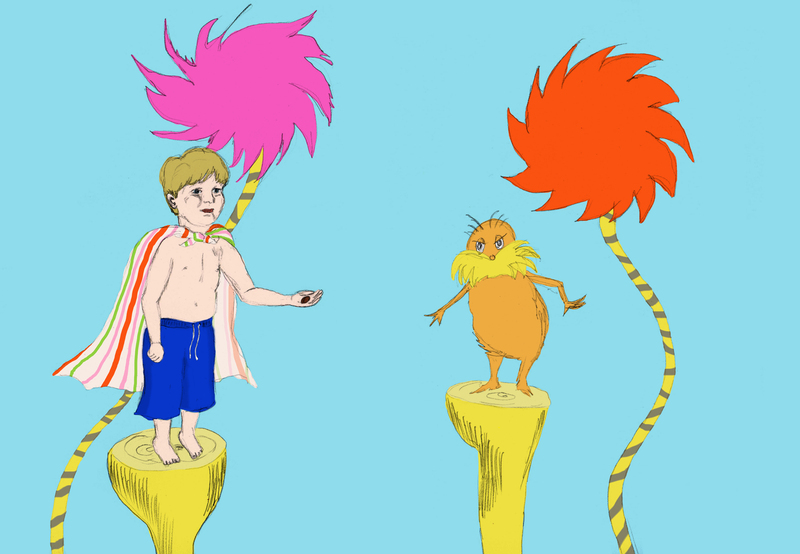 He comes across the mysterious Once-ler, the only living being there, who tells him the story of discovering this idyllic land, once filled with adorable animals and a forest of beautiful “Truffula trees”. The Truffula trees are topped with fluffy, candy-colored foliage that the Once-ler used to knit cozy garments called Thneeds. This quickly becomes a profitable business. As the business grows, the Once-ler builds factories and chops down many, many trees, to keep up with the public’s demand for Thneeds. As the landscape changes a small mustachioed figure called The Lorax appears, saying, “I am the Lorax and I speak for the trees.” He urges the Once-ler to care for the land so that the animals and plants can survive there. The Once-ler, who has become wildly successful, ignores the Lorax’s warnings and eventually the air and water become so polluted with waste from the factory that all of the animals are forced to leave. He short-sightedly chops down all of the Truffula trees as well, leaving his business unable to survive, and leaving him alone and broke on the land that he has decimated. Zeke was engrossed by the story and as I read his brow creased with concern and his blue eyes grew wet and heavy. In his 4 years, he had never encountered the concepts of corporate greed, environmental devastation, or short-sighted selfishness that the story explores and again and again he asked me to explain why the Once-ler would act this way. As I read on I began to wonder if I really wanted my kind-hearted little boy to be aware of this negative side of human nature. He seemed so deeply effected by the Once-ler’s actions and by the powerlessness of the Lorax who speaks up, but can’t seem to bring about any real change. The Once-ler summons the little boy closer and tells him that when the land was left uninhabitable, the Lorax picked himself up and floated away, leaving only a stone carved with the world UNLESS. He drops into the boy’s hand a tiny seed, the last of the Truffula seeds, and explains to him that UNLESS someone like him cares about things, nothing will change. He urges the boy to take care of the seed, to give it clean water and air, to protect it, and grow a new Truffula forest, so that maybe the Lorax and his friends can come back. And as I read the closing lines I could see Zeke’s mind working. He had the joyous light of hope in his eyes and my arms broke out in goose-flesh as I looked at his ecstatic expression and realized what a profound impression this book was making on him. He spent a long time flipping through it, gazing intently at the pictures, his eyes still lit with possibility. On a sunny afternoon a few days later, we visited a nearby pond to go swimming. Aaron took Zeke out into the water, while I took Jack by the hand to explore the weeds by the edge of the pond, in the hopes of scoring a glimpse of a frog, a turtle, or a darting school of minnows. We came across a group of children hard at work on an ambitious project. They were mostly spindly-legged boys, with sun-bleached shaggy hair, tirelessly carrying out the orders of their leader, a long-legged girl of about 12, her hair in thick brown braids. She directed them with a stern humorlessness and angry confidence that had clearly been learned from the adults in her life. She had broken her crew into two groups, each group working resolutely on the two sides of what I will call, “Project Salamander”. The weeds by the edge of the pond were filled with little adorable, squishy, brownish-greenish salamanders who were covered in perfectly round yellow spots. Their eyes were cheerful black bulges and their mouths curved upwards into friendly smiles. If you spotted one, like a shadow beneath the water, you had to move swiftly and decisively, or it would just dematerialize and instantly find refuge somewhere in the deeper darker water. Half of the kids were trapping and collecting the slippery salamanders in a large red sand bucket– they had nearly 20 when we arrived– while the other half were constructing a pond for them. It was about 3 feet across with thick sand walls. They filled it with pond water and artfully scattered silver-dollar sized lily-pads over the surface, presumably to make it more natural and appealing to their amphibious captives. Jack, who declared his intention to be a zookeeper shortly after his second birthday, was immediately entranced. He watched the children excitedly and, like the boys working on the Project, he quickly grabbed a bucket and fell in line behind their leader. Under her business-like, watchful eye, Jack was allowed to pour a bucketful of water into the newly constructed pond and to hold a salamander and pet it. When the small pond was complete the leader allowed Jack to place one hand on the red bucket as her crew transferred the salamanders to their new home. Disapproval registered instantly on her face when she examined the murky boy-made pond and the salamanders lying sluggishly at the bottom. “NO!” she snapped. “This isn’t working! They blend right into the sand so we can barely see them! And they aren’t really moving!”She dipped an authoritative hand into the pond, “No Wonder! This water is too warm! It’s warming up too quickly! We need cold water! Now!” She snapped her fingers at one of the boys. When the boy returned with cooler water from the large pond and poured it carefully in, a portion of the sand wall slid down into the water, further obscuring the salamanders. “They are going to get away!” the leader shrieked furiously. “Collect them! Put them back in the bucket!” She counted them carefully as each salamander was recaptured and put back in the sand bucket. The pond abandoned for now, she put her entire team on the job of catching more salamanders. They walked slowly and carefully into the water, holding white nets. After each step they waited for the sand to settle to keep their view of the bottom clear. When a salamander was spotted, they swooped their nets down and scooped the little fellow up before he could scoot off to freedom. As she spoke, the boys stood carefully at attention, awaiting instruction. By now, even I was a little bit afraid of upsetting her. As I watched this bossy, brown-eyed girl, I flashed on the camping trips that my family used to take near the New York/Pennsylvania border when I was a child. I remember supervising my younger brother and sister as we scoured the forest floor, searching for these sweet little newts that were a bright, story-book illustration tangerine. We too would collect them in buckets, which we lined with grass and sticks to make perfect little habitats for them, where we imagined they would live contentedly as our pampered pets. I clearly remember how I would love them fiercely for an afternoon, or until something else caught my fancy. So, I was quite taken by Project Salamander. I desperately wanted to pick up the salamanders and cuddle and kiss them too, but being the adult, I felt that it was more appropriate to insist upon my children acknowledging how amazing they were. The boys’ cousin Nathan was with us at the pond and I lured him over to the bucket with an enthusiastic awed voice that never fails to pique childish interest. “No! NO! They don’t have enough room in there! And my confusion at Zeke’s odd effort to ruin the children’s project disappeared as I saw his deep compassion and his furious passion. In that moment, Zeke was the Lorax and he saw beyond the charming amusement of a group of children, to the suffering of the confined salamanders, who deserved absolute freedom in the vast, cool, deep water that was their home. As we prepared to leave our Vermont cottage, an impressively violent thunderstorm materialized. Thunder shook our little cottage. Lightening flashed across the sky and rain pounded the fields. Zeke and I were inside, finishing up the packing, while Aaron and Jack took out the garbage and got our truck. And I remember smiling back at him, a great looping love in my heart, as I held his warm little hand and we looked out together at the staggering power of the storm.